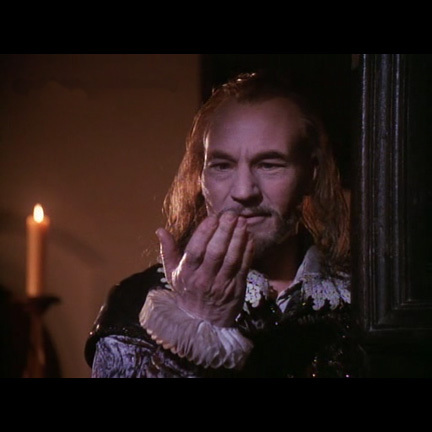 This 17th century period costume was worn by the character “Sir Simon de Canterville” portrayed by actor Patrick Stewart in the 1996 made for the television Hallmark feature “The Canterville Ghost”, also starring Neve Campbell. 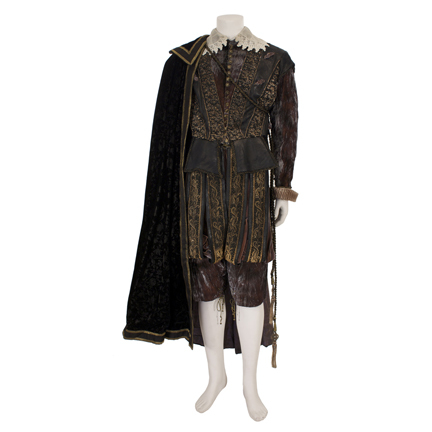 The costume was custom made for Mr. Stewart and consists of an undershirt, doublet with matching breeches, a cape, and prop neck iron. The cream-colored shirt has long billowing sleeves and an ornate lace pointed collar with string tie at the neck. 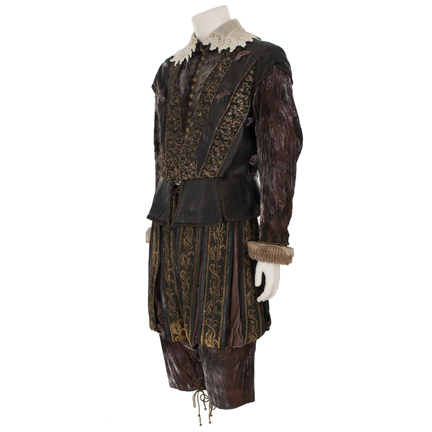 The peplum doublet with gold buttons and matching slashed breeches are constructed of black slashed leather and crushed gold and grey velvet, and decorated with wide bands of ornately patterned gold embroidery. Cream frilled cuffs are attached to the wrists of the doublet sleeves, and the breeches have a label sewn inside by “Qiana, London”. 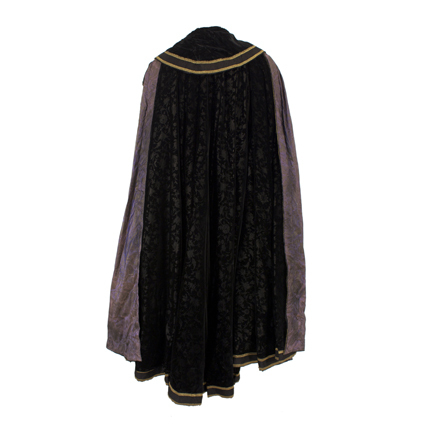 The mid-calf length cape is constructed of a floral patterned velvet trimmed with wide gold and black ribbon and is lined with iridescent purple damask. Also included is the screen used prop neck iron attached to a length of chain made of rubber and hand painted to resemble rusted metal. 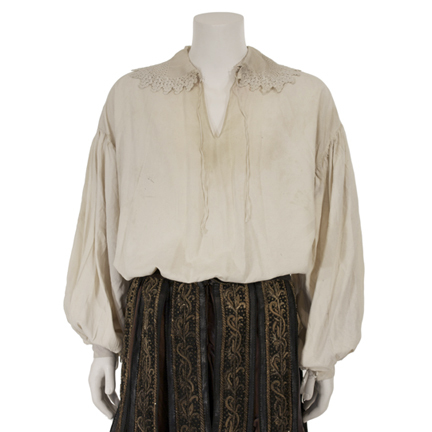 This outfit was Mr. Stewart’s primary costume change worn in different combinations throughout the entirety of the movie. 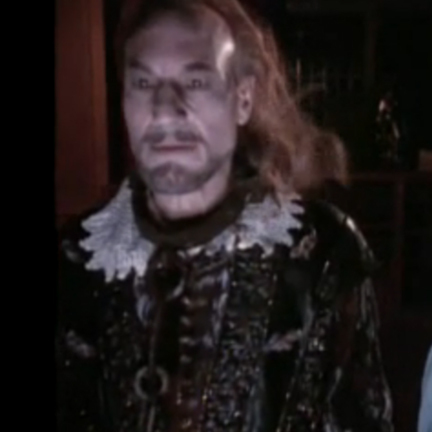 Mr. Stewart wore the costume with and without the cape, doublet, and chain in multiple scenes. In addition, Mr. Stewart can be seen wearing a variation of the costume without the cape and neck iron in several posters and promotional images for the feature. “The Canterville Ghost” is based on a classic short story by Oscar Wilde, and was also made into a 1944 motion picture comedy starring Charles Laughton. 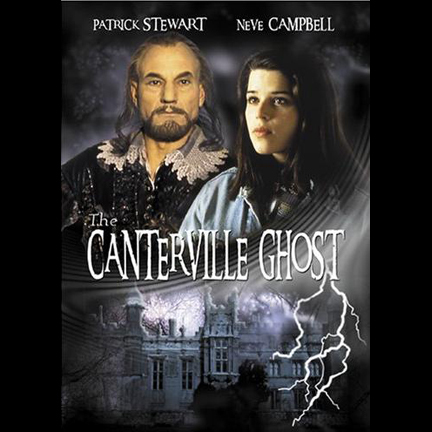 This 1996 family entertainment version featured one of actress Neve Campbell’s earlier roles and won a Primetime Emmy as well as four Family Film Awards in 1996, including one for Patrick Stewart’s portrayal of the tragic ghost. 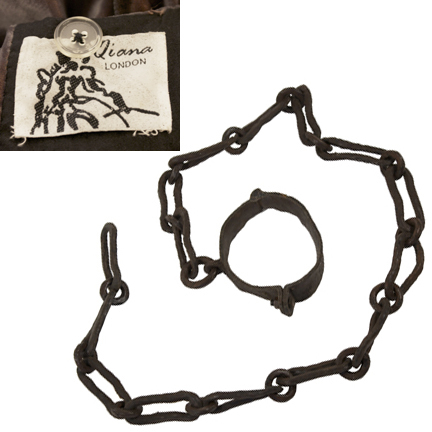 All the garments are in good hand-distressed / aged condition, and the neck iron and chain are aged as seen in their on screen use.